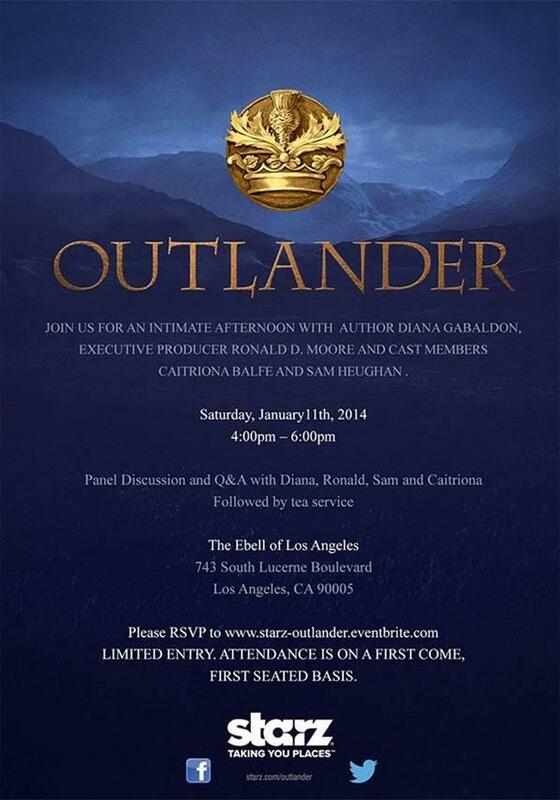 Spend an Afternoon with Diana, Ron, Sam, and Caitriona in LA!! On January 11th from 4 pm to 6 pm there will be a Q&A with Outlander author Diana Gabaldon, Producer Ron D. Moore, and cast members Sam Heughan (Jamie Fraser) and Caitriona Balfe (Claire Randall Fraser) followed by tea. This is a first come, first serve event! This means if you cannot go, please leave openings for those who can. It also means that if you can go, you need to RSVP to the email in the flyer (see below) as soon as possible. Good luck, and can’t wait to hear more about this event!! UPDATE (12/23/13-by Sarah): Previous to this update, the event was sold out. Starz has now elected to move the event to the Orpheum Theatre in LA, which is a larger venue. We won’t be in attendance, but from the gist of this sentence, it appears that even if you have an RSVP, you still may not get in. It is a first come-first seated, which also means that if you don’t have an RSVP, you might still be able to go. BUT, if you are not going to LA, you can join us and Outlanders across the globe in watching a livestream of the event. YES!!! This entry was posted in Caitriona Balfe, Diana Gabaldon, Ronald D. Moore, Sam Heughan and tagged Caitriona Balfe, Claire Randall Fraser, Diana Gabaldon, Jamie Fraser, Outlander, Ron D. Moore, Sam Heughan, Starz by Johanna Underwood. Bookmark the permalink.